Try our new free games, no registrations required. Vixine.com is an Adult Furry Fantasy comic book membership website. 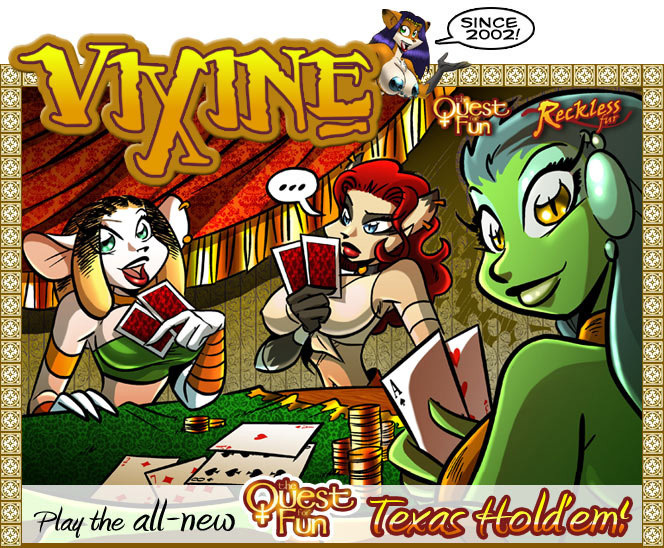 This site first started out featuring the comic series Vixine Classic, starring a group of adventurers stumbling around in a fantasy world doing the adventurous thing. It was a collection of short stories about the gang, told over 1-5 pages per "episode". We later retired the gang, and wanted to expand on this Vixine universe, and focused on more of a comic book like structure. The "Quest for Fun" series was born and later "Reckless Fur". You can learn more about each of these stories by visiting our Free Preview section. Vixine has been around since 2002. And growing more popular each day, thanks to the furry fans.